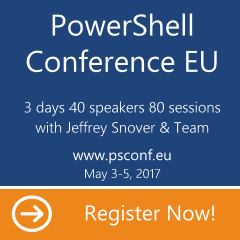 Recently on various occasions I was talking about consuming PowerShell remoting in a ways different than one that is usually used in demos. What you will usually see is connecting in good-old ssh fashion – using console window directly. One of two chapters I wrote for PowerShell Deep Dives book is about consuming PowerShell remoting using PowerShell Web Access. Today I would like to share practical implementation of other wonderful pair: PowerShell remoting constrained delegated endpoint and GUI script, that is build on top of it. It was used at my work for few months and because primary reason it was built for in first place is no longer valid – it will be removed soon.